When Halloween comes around, most people immediately go for a clothing-based costume. Sure, those look stunning, but why spend all that money when you can create just an equally stunning costume with nothing more than makeup? 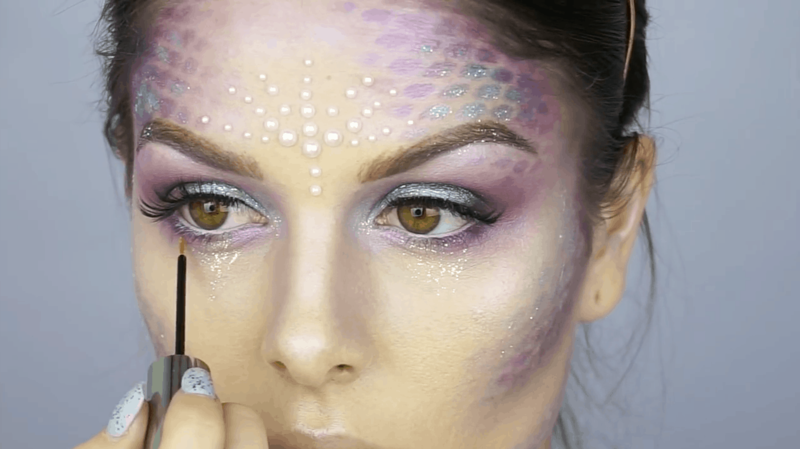 Here are some easy Halloween makeup ideas (plus one costume that’s based around your hair) that will make you look incredibly fabulous without breaking your wallet. 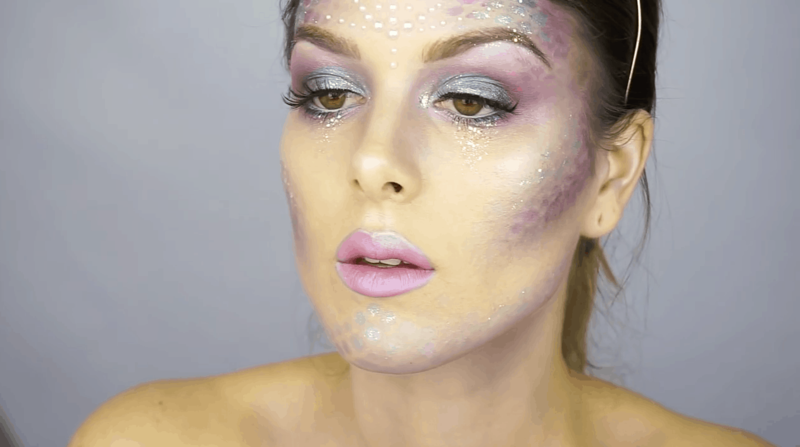 This mystical, deep sea look is one of the best easy Halloween makeup ideas out there. 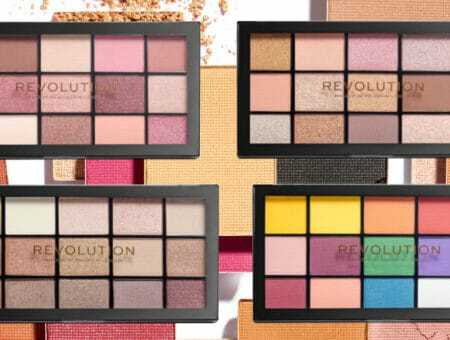 You really only need one main product: colorful eyeshadow. The best part is that you can work in whatever color scheme you want! I’m personally living for Rhiannon Claire’s purple, teal, and aqua combination. First, lay down a solid base of your darkest color anywhere you normally contour (cheeks, forehead, jawline, etc.). Then, lay a pair of fishnets slightly offset or directly over these areas and dab on your medium-toned color to give the appearance of scales. Do this again with the lightest color to create an incredible multicolored scale look. For the eyes, use the same three colors to recreate a three-color gradient on the eyes. Apply the darkest shade all across the lid, the middle shade in the middle of the eyes, and the lightest shade on the inner corners. 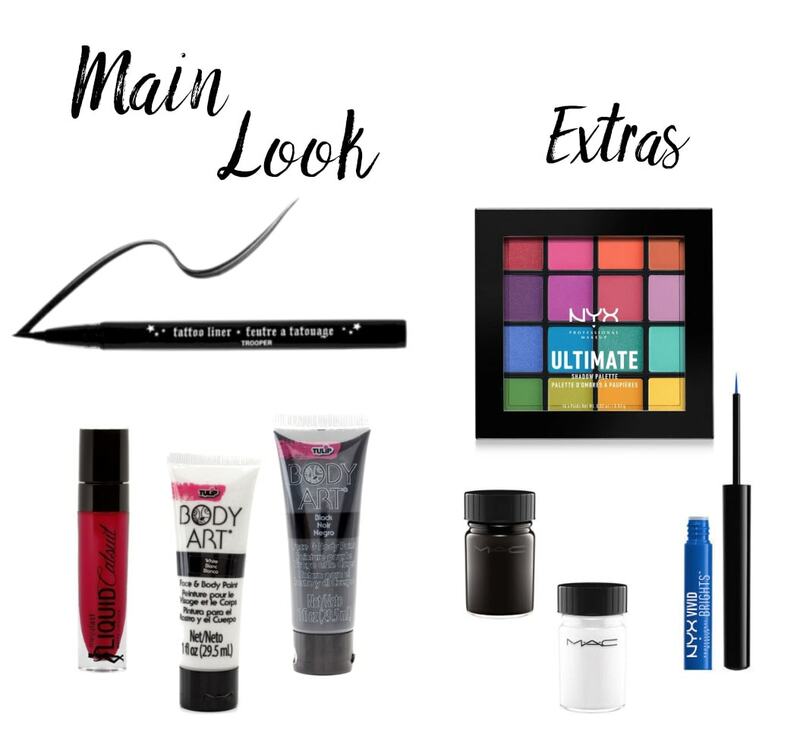 Be sure and apply mascara so your lashes stand out against this bold look. 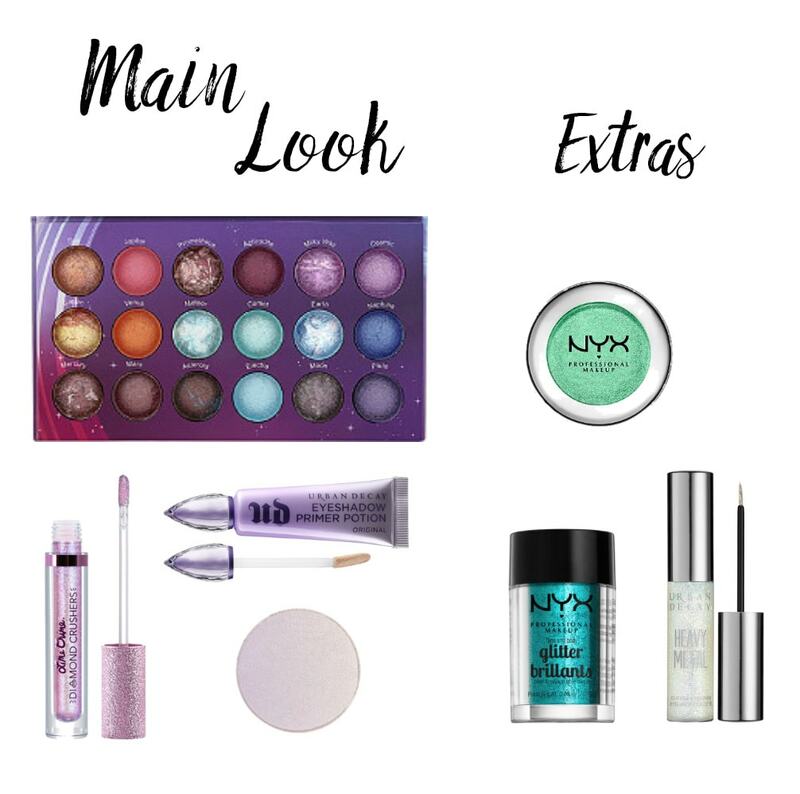 Last, apply some holographic or iridescent lipstick to complete your mermaid makeup look! If desired, add some pops of glitter with a holographic glitter eyeliner over the scales. P.S. If you don’t have fishnets/don’t want to buy them, you can totally apply the eyeshadows in this format without the scale effect. The mermaid magic will still shine through! 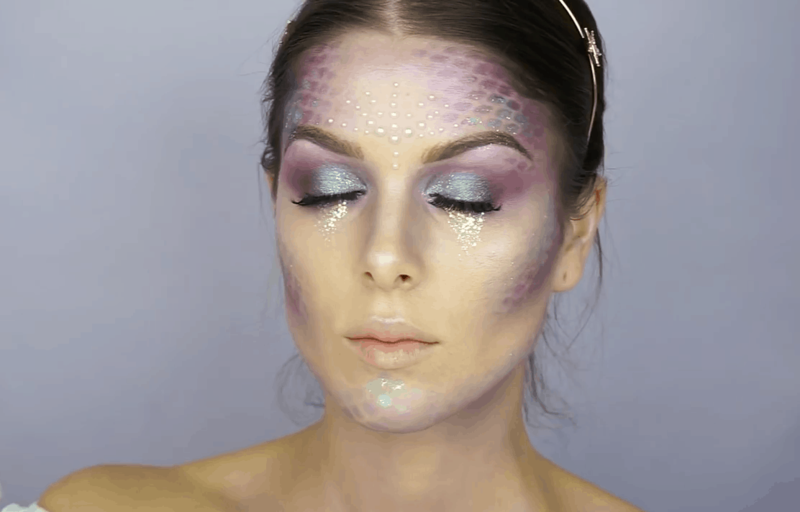 Also, this makeup look would work great for a unicorn or fairy costume if mermaids aren’t your thing. This makeup idea might look intimidating to try for a Halloween costume, but it’s quite easy to manage! You can easily adjust the intensity and detail of this costume so that it suits your particular drawing abilities. All you need is some black and white waterproof face paint or liquid eyeliner, and you’re ready to start. Explaining how to create this look is hard, since it largely depends on your face shape and features. Truthfully, watching a video where someone applies the paint in real time (like these from Madeyewlook or Nikkie Tutorials) will make it easier to follow. Generally, black lines are drawn over the stronger features of your face and where shadows naturally fall, while white lines act as accent marks to exaggerate where highlights naturally exist on the face. 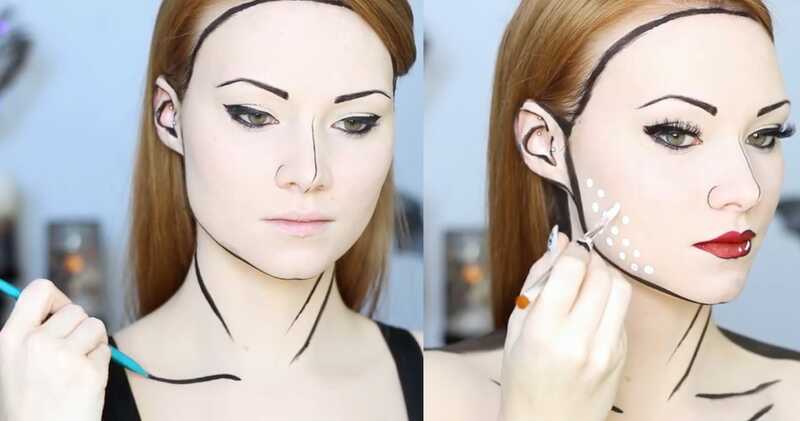 For the simplest pop art or comic book-inspired makeup, apply black lines in the hollows of your cheekbones, above/around the eyebrows, on the perimeter of the face, on the neck and collarbone, and on the perimeter of the lips (after applying red lipstick of course), and apply white paint on the tip of the nose and as an accent on the bottom lip. To add a second level to this costume, use the end of a makeup brush to apply white dots across the face and use some blue eyeliner to draw cartoon-like pool of tears under your eye. You can keep this comic book look general or go bolder and create pop-art versions of comic book characters! 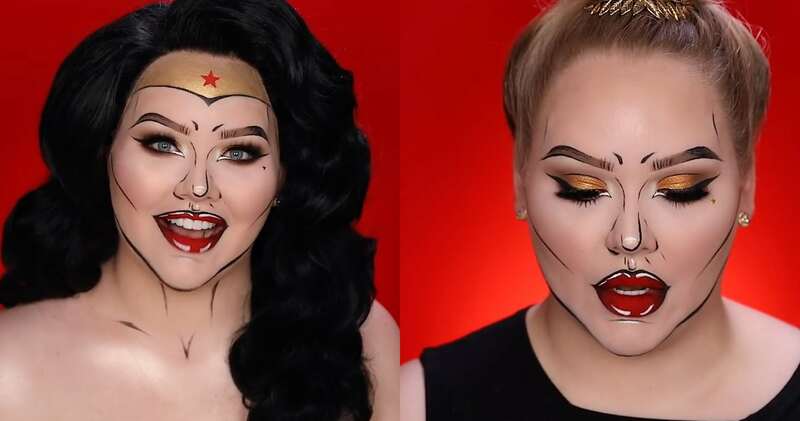 Harley Quinn (by Jordan Hanz) and Wonderwoman (NikkieTutorials) would make for fantastic costumes. Their videos give excellent details on how to nail these looks. This option is great if you and friend need a paired costume. What better choice than to go as one of the most iconic friend duos of the 2000s? Lizzie and Miranda were total friendship goals! This idea is also a great solo costume if you don’t want something makeup-heavy for Halloween. Instead, this look is all about the hair and clothing, and involves some of the flashiest 00s hairstyles of the decade. 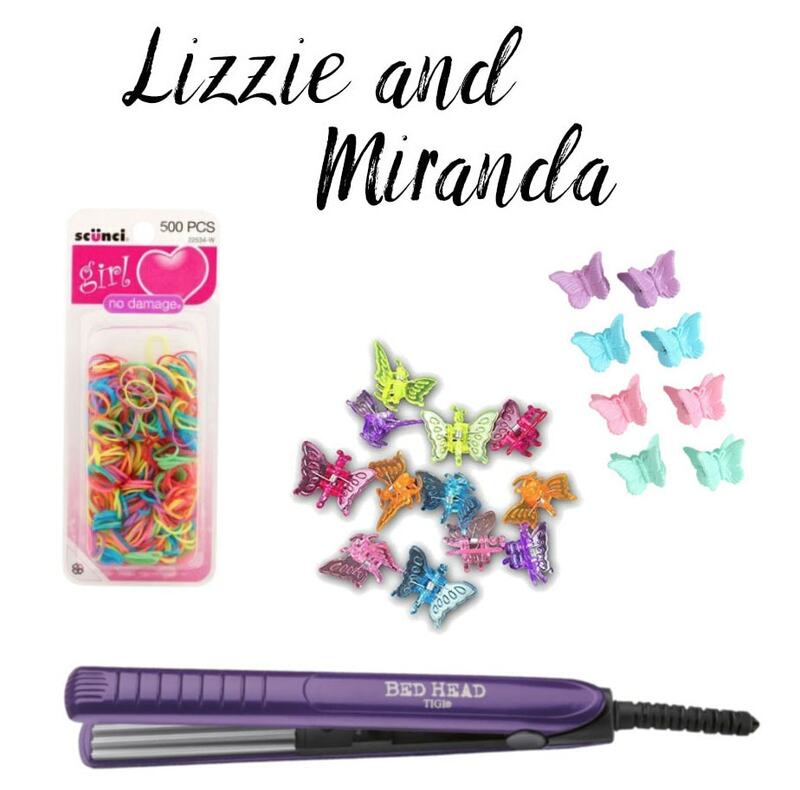 Lizzie’s hairstyles are incredibly simple, and involve the ever-prominent crimped hair and butterfly clip trends that we all know and love. 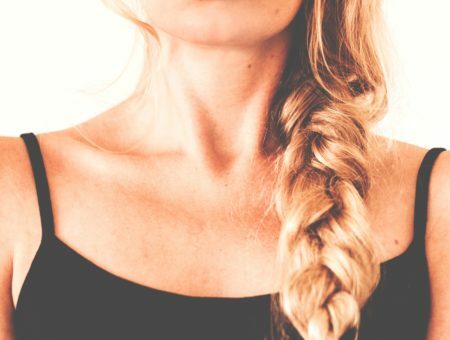 For this first look, crimp or curl random sections of hair. Then, clip back multiple thin sections with butterfly clips. Done! For a different, more advanced style, take hair from around the crown of your head and form four mini buns in a row. Pin them in place, and then pull the rest of the hair up in back into a giant alligator clip. 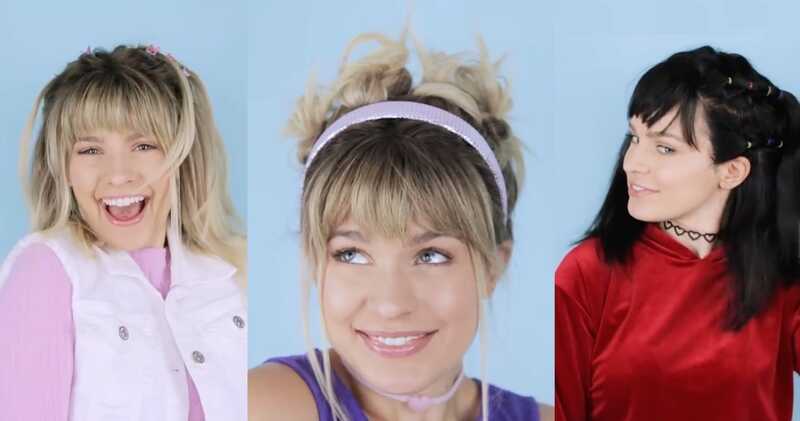 Add a headband, and you’ve got a Lizzie-inspired hairstyle! Miranda always had cool hair, and this style does not disappoint. 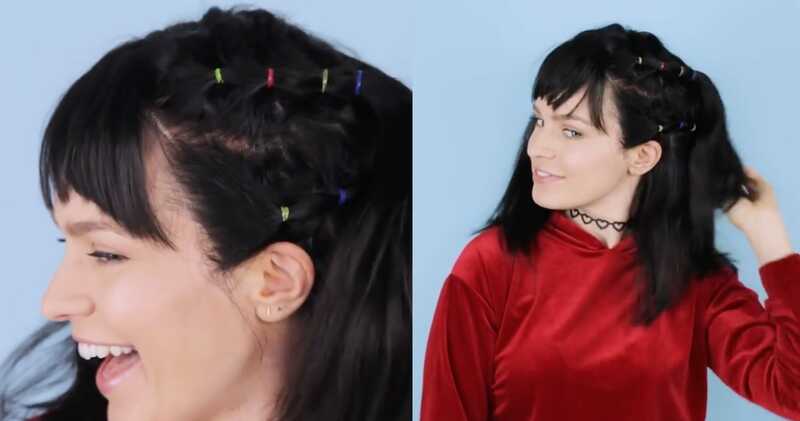 Separate the hair into two big sections on either side of the head, and use colorful elastics to tie off thin sections on the upper side of the head. Keep tying back sections, adding the front sections as you extend this row of elastics to the back of the head. Use about four elastics. Repeat this with the hair underneath this first row and on the other side of the head. Classic Miranda look! 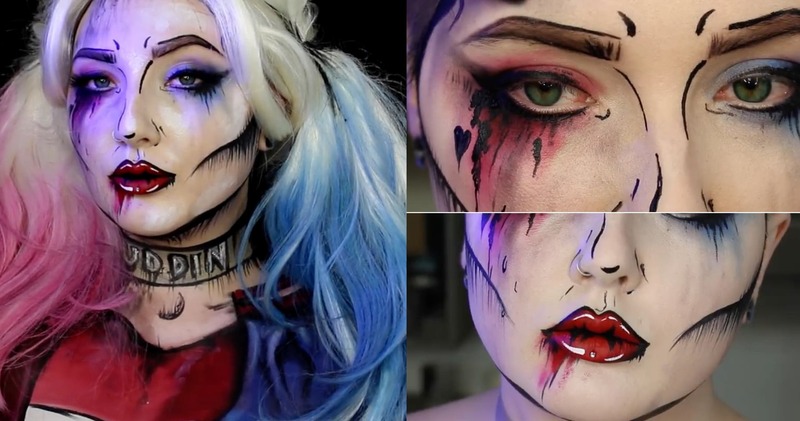 Which of these Halloween makeup looks are you going to try? 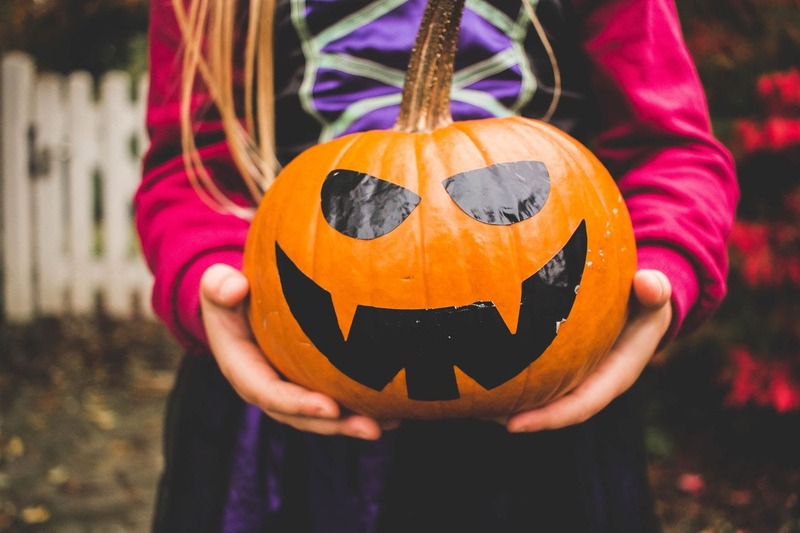 What are you going as this Halloween? Share below!